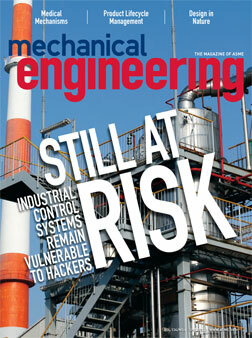 My June column in Mechanical Engineering magazine. One of the things that we can’t seem to come to terms with on staff is the extent to which we should cover nanotechnology. Some of the editors think that we should lay low until there is a significant new breakthrough, since much of what’s going on in the field right now remains in R&D. Others say nanotechnology is the new engineering backbone that stimulates future advancements in most industries and we should monitor its progress regularly. One of the things that we do agree on is that there are areas in which nanotechnology has indeed lived up to its early promise. One of these is nanomedicine, where nano-engineered solutions range from medical diagnostics, therapeutics, and imaging to regenerative medicine and tissue engineering. In an article on nanomedicine in this issue, authors Guy M. Genin and Ram V. Devireddy note that more than a decade ago Mechanical Engineering featured an article called “The Great Out of the Small,” which introduced the potential of the then relatively new and uncharted world of nano-engineering. Back then we speculated on how nanotechnology could transform industries and revolutionize the medical and biomechanical fields. This month, Genin and Devireddy write about the engineers—many of them ASME members—who have advanced the field in ways that seemed fantastical twelve years ago. These are innovators whose vision has driven their work. One of the reasons we continue to have the conversation among the editors about covering nanotechnology is that many of those who work in the area of nanotechnology are outliers. They don’t match up well with conventional ideas of technology. It is easier to celebrate the successes of outliers than their work because outliers go about their business in ways that are not readily familiar. Earlier this year, in an article published in the Harvard Business Review, Columbia Business School professor Rita Gunther McGrath wrote that one of the traits that marks companies that are outliers is that they’re “built for innovation… they can move on a dime.” McGrath says that these companies favor adaptability over pure efficiency. While they are unusually stable, those companies that are high achievers are also, paradoxically, highly flexible. At a digital conference in Orlando, Fla., last month, McGrath gave a keynote address focusing on her research and highlighting the effectiveness of companies that embrace the approach of systematic innovation, especially when adopting new technologies. Her examples were case studies of companies in various areas including the beverage, information technology, and pharmaceutical industries. Although McGrath focuses on corporate strategy, in a chat with her about the traits that set companies apart as outliers, it became apparent that ambition is a foremost common characteristic. It is this singular trait that is perhaps the most important and common among companies and individuals who succeed—even more so than basic smarts. While we’re not likely to come to a complete agreement among the editors on whether we should cover nanotechnology in every issue of the magazine or only once in a while, we aren’t about to ignore the developments or the individuals who are on the forefront of change—the outliers, if you will.